We all got up very early yesterday morning to catch the train to Venice. Our orders were to meet at the school at 6:45 a.m., and so we did. We all made it to the station (on the bus, a new adventure) and settled in for the hour and a half train trip. It seems incredible that Venice is that close--but it is. We pulled into the station in Venice by 9:30, just in time to catch a vaporetto for San Marco for our scheduled tour. The boat trip was exquisite. We had a gorgeous, sunny, warm (but not too warm) day and the sea air revived us after our early start. We went the long way around, through the Guidecca Canal rather than down the Grand Canal--to my mind the best way to approach the city. I love seeing the Zattare and the bottom side of Venice. It felt very familiar after my two-week stay there in 2003. Our time in Venice began with a tour of the city. We went from San Marco to the Rialto Market and back, with stops along the way to hear about the layout of the city, the way the buildings were built, the important architectural styles and details, and the culture of daily life in this fabulous city. At the Rialto Market, the students had some time to explore the goods on their own. I found out that in ten days (June 6), the baby artichokes will appear at the market. They are very special and unique to Venice, and they have only a two week window before they disappear again. They are grown in the islands somewhere and I have to get back to Venice during that time to check them out. After our tour, we spread out across Venice to to our various things. Rala, Peter, Federica, and I went to the Dorsoduro in search of lunch, ending up on the terrace in front of La Calcina. 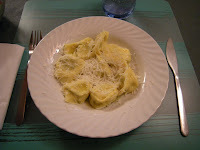 Lunch was delicious--Federica and I had fish ravioli with zucchini sauce, Rala had tagliatelli with lobster, and Peter had octopus. We all had cafe corretto with grappa and then walked down to Nico’s for gelato. An ideal way to spend an afternoon! We strolled around until it was time to meet the students and head back to the stazione. Home around 8:30 p.m., sunburned, tired, happy. This morning, I had class at 11 a.m., where we discussed the cookery and foodways of ancient Greece and Rome. After class, a bunch of us went to the Mensa, the student cafeteria, where we have eating privileges. For 7 Euros, I had speck (prosciutto) and mozzarella, plus a plate of pasta, peach tea, and a kiwi. The scene is very interesting--lots of students and our students are trying to figure out how to meet them. In time. Later, I had offered to lead a field trip up to the Museo Archeologico. We got there about 5:30 p.m., paid the student rate of 2 Euros for tickets, and wandered through the museum, which is located in the Teatro Romano. The teatro has been restored to the point where theatrical performances are held regularly, and the museum exhibits the many surviving fragments--architectural elements, mosaics, and sculpture--from the original building. In addition, there is a nice exhibit of Roman glass toilet and table wares, and another of Roman oil lamps. It is a lovely spot with a sweeping view of Verona, the theater, and the river. After the museo, we all walked back towards our apartments and dinner, with a stop at the mercado. 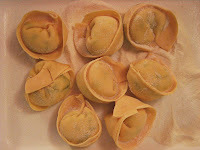 I found a shop selling handmade pasta, Casa del Raviolo, Via Carducci, 27, and bought some beautiful-looking tortellini with basil, ricotta, and pine nuts. They were ottimo!